If you have never gone snorkeling or scuba diving in Cabo San Lucas, you are in for a treat. It won't be anything like you remember snorkeling back home where you struggled to find a couple fish. 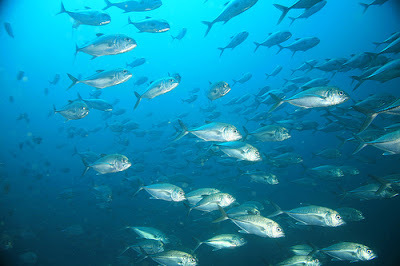 In Los Cabos, there are thousands of fish swimming and playing in the nearby waters all day long. It doesn't matter if you are five feet or 100 feet deep, you will have plenty of sea life to swim around. 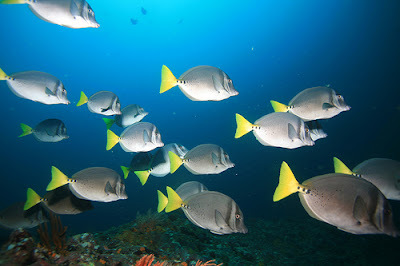 The Sea of Cortez has morevarieties of fish than any other place in the world, so you will never be dissapointed with scuba diving in Cabo San Lucas. There is a good chance you will encounter multiple types of marine life while diving and snorkeling in Cabo San Lucas. Manta rays, sharks, sea turtles, tropical fish, seals, and giant tuna are just a few species you might get a glimpse of. Depending on where you dive you can also see things like coral reef or even underwater sand waterfalls that fall off into a deep abyss. There is no limit to what you will see diving in Los Cabos. Average Prices: If you already have a PADI diver certification it will cost anywhere between $75-$235 depending on how long you are out on the water. If you are interested in snorkeling the shallow waters of Cabo you can find tours ranging from $25-$75 including gear. For the amount of marine life you will get to see in a day, snorkeling and diving activities give you the most bang for your buck in Cabo San Lucas.